Monday already! Could you believe that September is coming to a close soon? Well, neither can I. Time flies when you are having fun. And fun is exactly what I had when I got a chance to try three different whiskies from one whiskey family range. It is not often that I get to do that, so I enjoyed every minute of the experience. My good friend from college Matt absolutely LOVES the Irish whiskey, Tullamore D.E.W. I got a chance to go through his collection during a recent visit I made to him and his wife Sarah down in Cape Cod. It was easy to get him to share the original and the Old Bonded with me (this triple distilled Old Bonded Warehouse reserve is only available for purchase in the distillery building. It was created for the reopening of the Tullamore D.E.W. visitor’s center in September 2012). However, it was not so easy to have him share the Heritage with me. You see they are saving that bit for a very special occasion and since they don’t make the Heritage anymore, giving some away is certainly very hard to do. In the end he shared enough for me to write about it. Thanks again Matt! For my non whiskey drinkers who want a little history about this whiskey, here’s a little tidbit, Daniel E. Williams worked for the Tullamore Distillery. He worked hard and quickly raised up the ranks to eventually one day own the distillery. 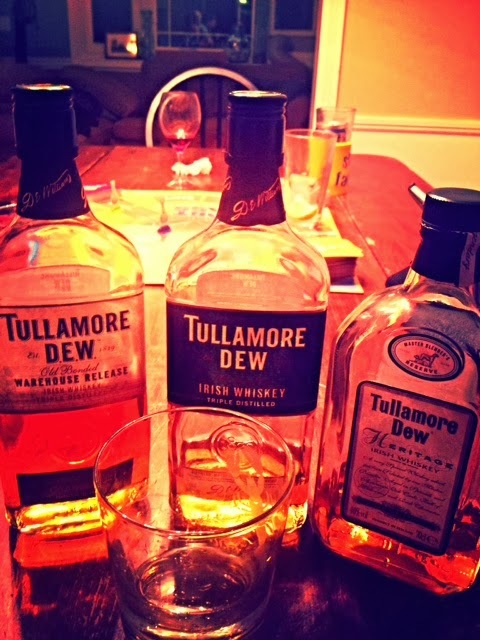 The whiskey went from just being Tullamore to Tullamore D.E.W. as Williams began adding his initials to every bottle. Their range now includes the original, 12 year old special reserve, 10 year old single malt and the Old Bonded Warehouse. If you want to hear a side story about drinking Tullamore D.E.W., Matt and I had a college friend in the military that got killed in Afghanistan. The night before his funeral services, a few of us gathered to tell stories about what a great man he was. That night, Matt and I nearly finished one entire bottle of Tullamore D.E.W. Out of the three that I tasted, to include their Heritage bottle, the one I enjoyed the most was their Old Bonded Warehouse release. To me it was the smoothest of the lot, but each of these whiskeys had their own very unique tasting notes. Taste: This one was light and smooth with a slight burn. My thoughts: Although it was enjoyable it was also very forgettable. Taste: It was rich and I tasted oak. There was a slight burn to the whiskey and sweet tasting notes. My thoughts: This was the one I liked best of the three. It was the most memorable and the one I enjoyed most. It certainly was a great tribute to the reopening of theirs visitor’s center. Taste: I taste wood. There was a burn to this whiskey with hints of spice. My thoughts: It was a strong whiskey and although nice, I enjoyed the Old Bonded more than I did this one. To me it wasn’t as smooth as I thought it would be. It is certainly more enjoyable than the original and I am extremely glad I got a chance to try it. Overall Tullamore D.E.W. is a great Irish whiskey, it’s not at the top of my favorites but it is certainly a whiskey that should be tried. In my opinion they have a clear winner with their Old Bonded Warehouse reserve. It’s very unfortunate that they only sell it in their distillery. Hopefully it is a whiskey they might eventually consider releasing to outside those doors. Tullamore D.E.W. will forever remind me of great memories and spending time with great friends during difficult moments. I know that I will always enjoy sharing a dram or two with Matt and Sarah on my visits down to see them. So go out there and share a dram with your friends.